Red Couch Recipes: "Book and Cook" Oven Eggs and "In the Neighborhood"
"Book and Cook" Oven Eggs and "In the Neighborhood"
Today I bring to you a "Book and Cook." A "Book and Cook" is where I read a book and then make a recipe inspired from the reading of the book. My favorite book I have read this summer is "In the Neighborhood -- The Search for Community on an American Street, One Sleepover at a Time," by Peter Lovenheim and published by the Penguin Group in 2010. On the street where Peter Lovenheim lived, Bob Wills kills his wife Renan Wills and then commits suicide, leaving their two children to run out at 10:30 in the night to seek shelter at a neighbor's home. "A family had vanished, yet the impact on our neighborhood was slight. How could that be? Did I live in a community or just in a house on a street surrounded by people whose lives were entirely separate? Few of my neighbors, I later learned, knew each other more than casually, and didn't know even the names of those a few doors down. Why is it that in an age of cheap long distance rates, discount air-lines, and the Internet, when we can create community anywhere, we often don't know the people who live next door?" After this tragedy, he felt compelled to find out more about his neighbors. In his quest, he even asked some of them if he could sleep over so that he could get to know them better. Others he interviewed or met for coffee or lunch. Of course not everyone would allow him to sleep over, but when he was allowed access to his neighbors, via a sleepover, he didn't want them to change anything as a result of his visit. He didn't want them to make any special food for dinner or breakfast. The author liked to greet people early in the morning just as soon as they walked out of their room; it was his favorite part of the visit. If the author came to the home of Red Couch Recipes, for a sleepover he might be served Oven Eggs. During the school year, I make Oven Eggs about once a week. 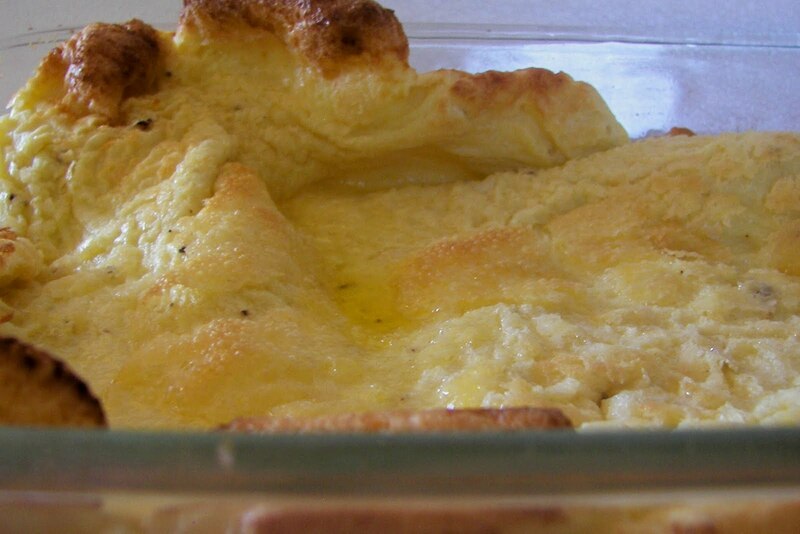 They are also known as Dutch Babies, German Pancakes, and many other names. The recipe is simple. Heat oven to 400 degrees. Put butter in 13 by 9 - inch pan and melt in oven. Be careful as butter can burn quite easily. Mix eggs, milk, and flour thoroughly with a whisk and pour in pan with butter. Bake in oven for 10-12 minutes (or a few minutes longer if you aren't using glass) or until the egg mixture has risen high and is slightly brown. It comes out of the oven high, but rapidly sinks. I enjoy Oven Eggs with Parmesan cheese on them. Others in my family like syrup and powdered sugar. If he came to our home, most likely we would eat on the deck. In his visits, Peter Lovenheim becomes acquainted with Patti DiNitto, a divorced mother of two young children. She was a radiologist and she had diagnosed her own breast cancer. The author, Peter Lovenheim, has connected Patti and another neighbor, Lou Guzzetta, together. Lou is an 81 year old retired surgeon whose wife has died five years earlier. Peter and Lou occasionally help out Pattie by taking her to the grocery store to doctors appointments, and to lunch or coffee. When Peter approaches Lou to help out Patti he says, "I'll drive her...She would be doing me a favor. Understand? My life is zero. I have nothing to do. Tell her I will drive her and she will be doing me the favor. I'll take her food shopping on Thursdays, to stores, whatever. Please tell her it would be a favor to me." As Patti's funeral Lou asks Peter how he got to know Patti. "I don't recall exactly what I answered Lou, but the truth is, I met Patti deliberately. I met her because it troubled me to think that one night , my neighbor Renan Wills feared for her safety and the safety of her children, but knew none of her neighbors well enough to seek shelter in our homes. I met Patti because later, I myself, came to feel isolated among those same neighbors. I met Patti because at some point it seemed both absurd and wasteful to be living unconnected to the people all around me." In one of the author's closing remarks he writes: " The community of neighbors that I'd set out to find, I had found. Had I not undertaken the deliberate effort to meet them, I would never have known Lou Guzzetta's wisdom, or Deb O'Dell's talent and energy, or Jamie Columbus' artistry, or Bill Fricke's quiet strength of character. And I would have missed the chance, by embracing Patti DiNitto, to try to redeem in a small way our neighborhood's failure to have known Renan Wills." In one of his final remarks, the author concludes that if we want to break down the barriers that separate us as neighbors, "To do so, we really don't need to sleep over at each other's houses. All we need to do is deliberately set out to know the person next door, or across the street, or down the block; to ring the bell and open the door." So as Mr. Roger's used to sing "So who are the people in your neighborhood?" I really enjoyed this book, but I must give you a warning, you may need a hanky or two when you read it! You can get this book at your local library, as I did, or buy it at a bookstore or through Amazon, or another online book seller. 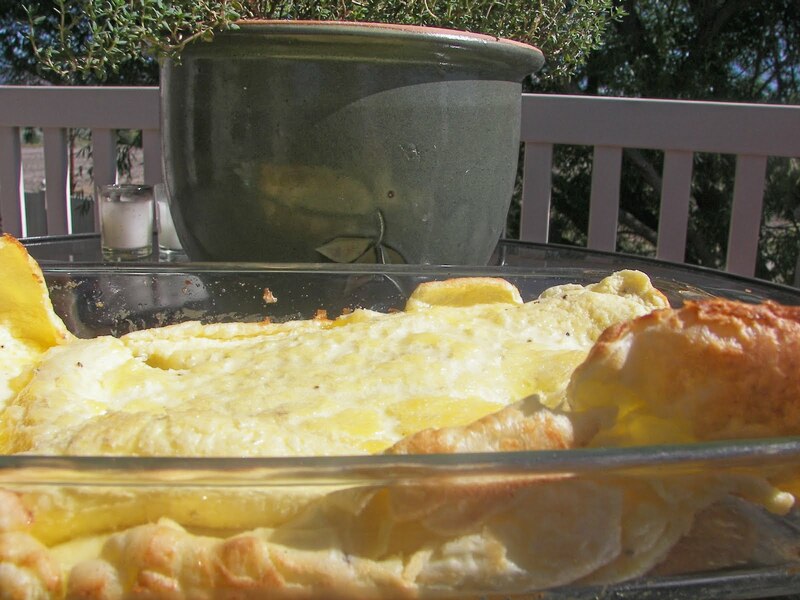 What a fun and creative idea...love your book review and ravishingly yummy Dutch Pancakes! I just love recipes and hearing about what others are cooking! I have had Dutch Babies/Pancakes before, served filled with fruits. delicious! You know, I had not thought about it until now, but DB are like large popovers. I'll definitely look for this book. It touches something about which I often think. We live in the country and don't know our neighbours at all. When we lost power last week, we had to find out if they had before making a report to BC Hydro. You could tell that people were a little nervous to look out and see a strange car in the driveway. The recipe looks great and I sort of like a book that needs a hanky! What a great book review! I'm going to check this book out. You have a terrific blog. Glad to have found you. Thanks for your kind comment on mine. I also thought that the Betsy - Tacey books and the Mitford books were wonderful. Have you made the Orange Marmalade cake? Yes, you should start a couple of linky parties ( you can always quit if you don't like doing it!) Book and cook and Recipes from the Hood. My husband is complaining that I am printing too many recipes off. Not my fault! We love these and yours looks so good. I like them when they are still bubbly and puffy and you captured that moment in your photos. Wow, love the idea of a recipe from the book, and as a non reader I am intrigued by this book and have ordered it from the library. Thanks for your kind words about "In the Neighborhood"--and those Oven Eggs look delicious! This would make the best premise/theme for a book club!!! Read the book, and the month's hostess creates a dish for the meeting! Now I need to start a book club-lol! We posted a link to this blog post because we love the idea so much! Great review! These eggs sound awesome, i didn't know what they were jus from the picture! They look so fluffy! The book sounds good - I think I'll recommend it to my book discussion group. The eggs sound great too. This was a fun post, Joni!